Recently we saw Matt Cutts play investigative reporter& literally create a story about how dirty some of Bing’s affiliates are. Here is the litmus test though: when Microsoft became aware of it they immediately canned the shady distribution partner. 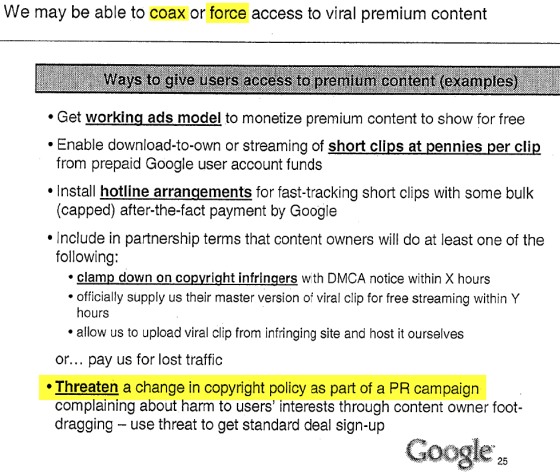 Meanwhile, Google still funds toolbars that put AdSense ads in them AND to this day Google still funds google.bearshare.com, which *is* driven by the same kinds of home page changes that Matt found distasteful. In Manufacturing Consent Noam Chomsky highlights that we should judge actions based on an equality of principals& that we are responsible primarily for our own actions. Yet Google complains about Microsoft. It took Microsoft less than a day to clean up their act, while Google still hasn’t fixed issues that were highlighted publicly 6 years ago! In our new site design our navigation is aggressively repetitive in some areas. 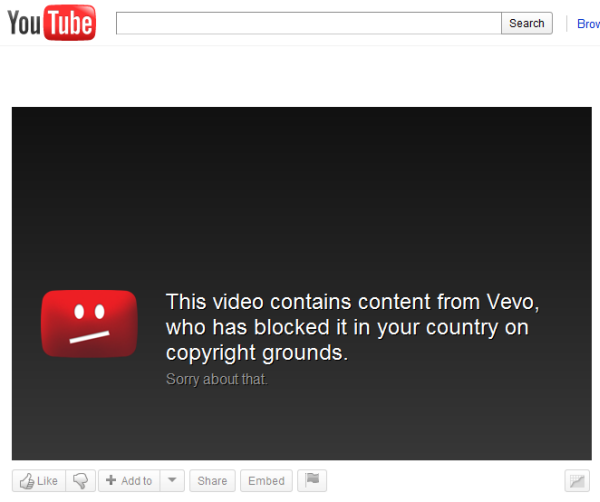 The reason we did that was some people complained about not being able to effectively get around the site. To help make the navigation more intuitive and consistent we use drop downs and in some cases have 3 or 4 or even 5 links to the same location. Is that optimal from a search perspective? Probably not. But then again, search engines don’t convert into paying customers. They are simply a conduit…a means to an end. When an engineer views a site they might not view it through the same lens as a customer would. What is an unnatural link profile? Does it depend on who is building the links? We know that at an SEO conference when some of IAC’s cross linking was highlighted Matt Cutts stated “those don’t count” but didn’t qualify it any further. 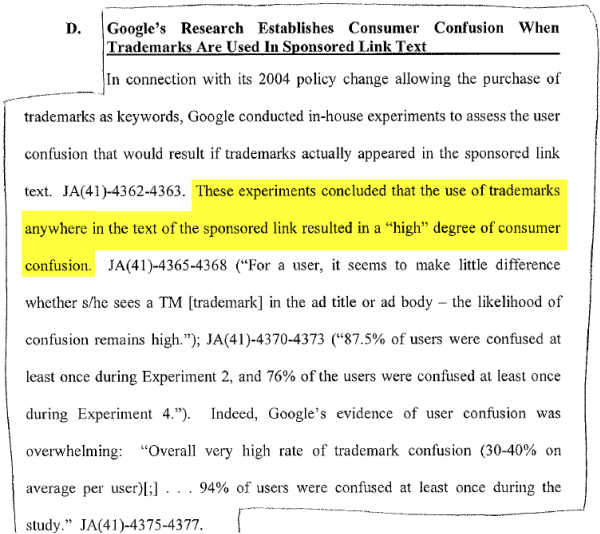 Likewise when it was highlighted how Mahalo was link farming we were told that they deserved the benefit of the doubt. Since then the link farms have grown and mutated. 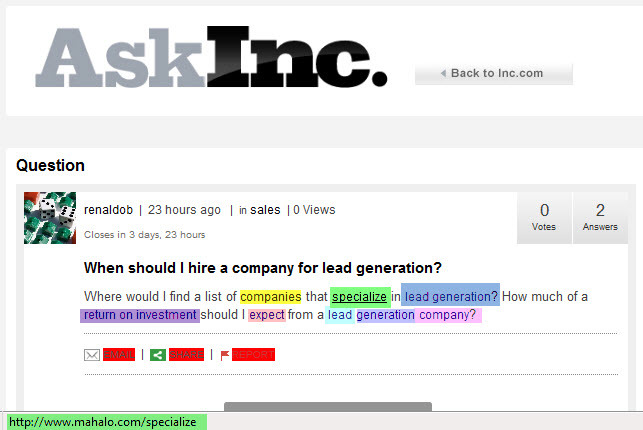 I won’t link at ask.inc.com/when-should-i-hire-a-company-for-lead-generation, but if I was told that the following is “natural” and “good to go” then I would have no problems building a few million links a week. Then again, I bet it would be “unnatural” if I did the same thing. Sometimes when clicking into big media sites that are ‘first click free’ I get kicked right to a registration page. In the past some iTunes pages would rank & force you into the iTunes software (though that may have recently changed). I accidentally screwed up using a rel=canonical on a page (cut the source code from a dynamic page and pasted it as the basis for a similar static page & forgot to remove the rel=canonical tag). Eventually I figured out what was wrong & fixed it, but both the correct and incorrect pages ranked for weeks at #1 and #2. And isn’t the whole point of the rel=canonical tag to give the search engines a different type of header than an end user (telling the search engine that the content is elsewhere while telling the user nothing of the sort)? Syndication has long been a part of the media landscape, where portals chose what bits to mix in from where. But how much is fine & what should be done with duplicates? When does something go from ‘legitimate syndication’ to ‘overt spam’? We see official Google blog posts which claim that AdSense ads are not allowed on unoriginal content, while Google has multiple large partners that wrap Google’s search results in the AdSense feed and then serve it back to Google. Site categories which were described as ‘shoot on sight’ become viable enterprises when a person puts a web 2.0 design, venture capital & some public relations into the same basic business model. If Google is going to put out some ‘thou shalt not’ styled commandments under the label of ‘fact vs fiction’ they should have consistent enforcement of obvious issues that have been brought up publicly numerous times, including on the very post highlighting the policy. But we know they won’t! They only care about dirty business practices if they are not getting a taste of the revenue stream (as shown by their BearShare partnership while policing Bing affiliates). Based on that sort of activity, when Google announcesa preference while promoting “openness” it is easy to see it as a step backward, hypocritical, or even as a farce. Embrace, extend, extinguish. When Google’s head spam fighter is doing public relations AND the Washington Post covers his lobbying you know Google is nearing a breaking point.